Welcome to the Above Ground Pool Builder; today let’s discuss pool decks. What are your options for above ground pool decking? Here, you will see some really cool deck ideas and learn about the different options available. The first thing you should do prior to building a pool deck is let your imagination set you free . Whatever you can think of is perfectly OK to do. The pool deck you decide on is one that you will look at and use for the next several years, it should be exactly as you desire. There are many new materials available to create the deck of your dreams. Sketch it out on a piece of paper, then it can come to life. Once you have it sketched, compare your ideas with your family and together you can break down what will be an absolute must and which things to omit. You may want that “water proof cubby for towels” and decide against that outside shower head. By eliminating the things you don’t want will bring about the desired look of your new deck. The most frequently asked questions regarding an above ground pool decks are: “What should the pool’s deck height be?” and “What material are best to use?” Although we are not deck builders here at the Above Ground Pool Builder, we do have some opinions based on our experience. 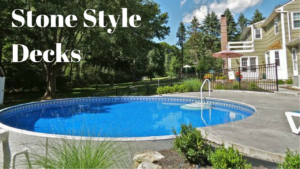 We have seen many decks over the years and know what styles are best when installers come by to replace liners or pools that have decks attached. Above ground pools come with wall heights of 48”, 52” and 54”. Manufacturers construct their pools with different sized parts, so even if a pool measures the same height, the final installed pool will always be slightly different depending on the manufacturer and the model. The reason is that some pools may have large top rails and others may have smaller resin caps. 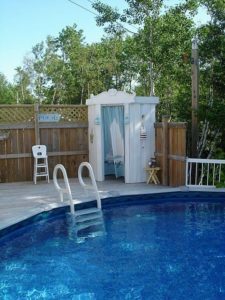 Expect to tweak your building plans during this phase depending on the make and model of your pool. 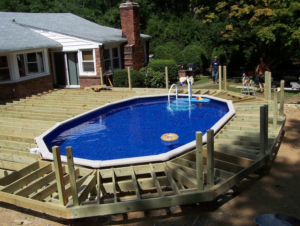 Semi-In ground pools can be buried halfway into the ground thus a deck around this pool will require less materials. The next step will involve getting a builder involved and drawing up blueprints. At the very least, go over all your points with potential contractors and choose the contractor that you’re most comfortable with. The contractor will design blueprints of the deck with the correct measurements and include the features you want. From here your budget will dictate whether you need to scale down or add more options. Contractors who build decks for a living will have ideas that may impress you as well. Let the process happen and don’t leave anything to chance. Let’s now chat about the different materials and styles of decks and pools. 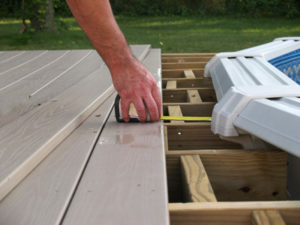 Decks can be build with wood, composite or a combination of these two materials. 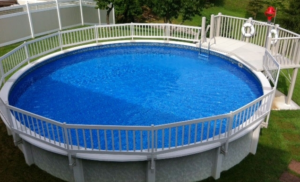 Also available are resin and aluminum decks which are pre-made at the factory and attached to the pool frame. Resin and aluminum premade decks are easy and straightforward; they are usually built at the same time the pool installed. If you are looking for an instant deck then aluminum or resin is the way to go. Composite decking has been around for about 30 years, the composite materials nowadays are a major improvement from the initial materials. When the composite was first used in pool decks it would warp and the screws would jut outward. Now, composite decks are smoothly built and do a great job of handling the weather changes. Another option is to build a pressure treated frame and then finish the rest off with composite materials. We think that cantor-levering a deck over the pools edge is a great Idea. The steps and ladders that you use to get in and out of the pool can be adjusted to work with this kind of structure. When doing this you want to consider how the top of the pool will come apart? It is best if you go parallel with the first deck board. When it becomes time to change your pool liner you will only have to take off one deck board instead of the entire deck area. You should know how the pool comes apart and build accordingly. We feel this is a good idea as well, just follow the last steps and know how the top system comes apart, this is important when liner needs to be replaced. This is another good idea and you don’t have to worry about how the top comes apart since it will not be affected. With this design you can achieve a multi-level look to your above ground pool deck. By having different levels you can have various areas that serve your needs, such as a sitting area or a grilling area separate from swimming. Creating a stone patio in combination with your deck makes for a modern looking pool. Try creating a cement patio around parts of the pool. Be sure to create the proper retaining walls so the pool doesn’t collapse. Being creative with your deck will make it your relaxation station. Feel free to look at the following ideas for inspiration. Your pool deck should be a place that you and your family will be proud to relax and enjoy for years to come. I am interested in having a deck built for an above the ground pool. Do you offer this service or know of a company who does? I would love a quote for my backyard. I live in Easton. 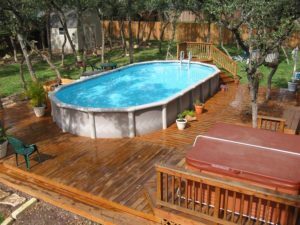 In order to have wood decking of this nature, you have to add coarse material to the paint or stain and this makes the pool decking hard to walk on in bare feet. 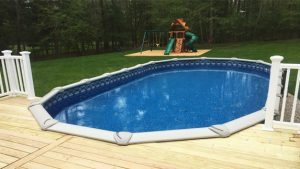 Composite swimming pool decking is the ideal solution for a swimming pool because it is slip resistant and it won’t rot or decay from continued exposure to water and humidity.